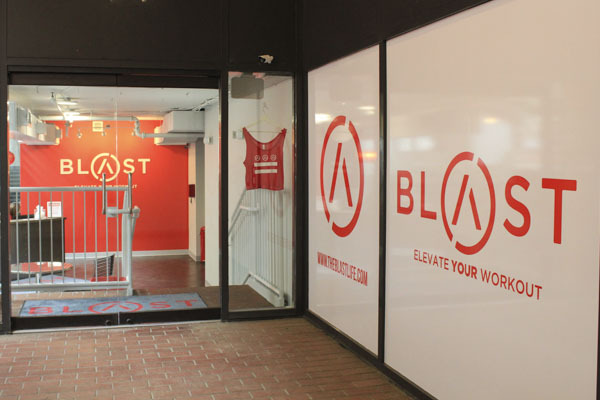 Exercise fanatics can take full-body workout classes and get a fitness evaluation at BLAST. If you’ve walked down M Street in West End recently, you may have noticed a new boutique fitness studio – boldly located adjacent to the old standby, Soulcycle. It is called BLAST, which stands for Balanced Level of Aerobic/Anaerobic and Strength Training. The M Street location is the only one in D.C., and the first outside of Atlanta, Ga. where founder Missi Wolf started the studio after the mother of two shed 100 pounds in two years. BLAST offers three main services: classes, fitness testing and nutritional counseling. I was curious to try out the BLAST trifecta, but I would be lying if I didn’t admit that I was pretty skeptical. As a general rule, I hate workout classes, though maybe not for the reason you might think. I like exercise and don’t typically have trouble getting myself to the gym, so shelling out $30 or more for mood lighting and a peppy instructor doesn’t seem like money well spent. So when I walked into the cheery studio and saw the orchids by the front desk and the prominent branding on the spandex leggings and cropped workout tops for sale, I wondered if that’s what customers were really paying for. But after completing the BLAST trifecta, I walked out feeling like I’d pushed myself and learned things about my body that I could not have done on my own. BLAST offers just one type of class: the Blast Full Body workout. Each class is 60 minutes of interval training, but it can be broken down in different ways depending on the day and instructor. The classes run about $33-35, depending on how many you buy at a time. The time was broken up into five-minute blocks during my first class. Coached by instructor Lauren C., we alternated between treadmills to floor stations with mats, free weights and resistance bands. Other classes are broken down into 10-minute blocks or alternate lengths of time, and instructors can switch up the strength materials at the floor stations. All BLAST classes use treadmills for the cardio portion, which I enjoyed. Doesn’t exercise feel better when you don’t do it sitting down? BLAST’s studio uses FreeMotion incline trainers that can go up to a 30 percent incline – much higher than the treadmills in the Lerner Health and Wellness Center. For each cardio block, Lauren C. called out three speeds as guidelines for where to set our treadmills based on our fitness level and how hard we were trying to push ourselves. With a combination of running, jogging and walking at different inclines, I built up a sweat quickly. My water was gone less than 20 minutes into the class, but no sooner had I started wondering if I could get some more than Lauren C.’s assistant plucked the empty bottle off my treadmill and went to refill it. Lauren C. peppered in some motivation, corrected our form and swore a bunch, which was great. She frequently told the class how much time was left in each block, and never told us we had 10 seconds left when we actually had 20. When class finished I was exhausted, sweaty and happy to know that I would be sore the next day. I went back to BLAST to meet with Sarah, the instructor who completed my fitness profile. For the second time, I recognized a GW student working at the front desk when I came in – expect to see familiar faces. The BLAST score is an overall fitness score determined by performance in a series of fitness tests. I did the ‘Classic’ BLAST profile which tested my strength, core, flexibility, percent body fat and the volume of oxygen my body consumes while running, which measures cardiovascular fitness. It costs $195. I left the appointment with a better understanding of how my workouts were contributing (or not) to my overall fitness level. For the cardio test, I was hooked up to a face mask and tube that would measure my breathing, put on a heart rate monitor and hopped on the treadmill. I’d been told not to work out the day before. The test takes up to 12 minutes – the maximum amount of time that the equipment needs to get enough information to tell you what your heart rate zones are and at what rate your body stops burning fat and starts burning sugars. I started at a walk, then Sarah gradually increased the speed of the treadmill up to seven miles per hour, then started increasing the incline. I learned that my body stops burning fat when my heart rate hits 184 beats per minute. Sarah explained that means if I’m trying to improve my cardiovascular fitness in a workout, I should get my heart rate above that point. If I’m trying to burn fat in a workout, I should stay below 184. She prescribed me a few different workouts for each option. While we got high-tech on the treadmill, Sarah measured my body fat percentage the old fashioned way, by measuring how much fat and skin she could pinch away with a tool (don’t worry, it doesn’t hurt). The strength, core and flexibility tests took me back to the Presidential Fitness Test in middle school – Sarah tested how many push ups and crunches I could do in a minute and measured how far I could reach beyond my toes. All in all it took about an hour and a couple hours after I left the appointment, Sarah emailed me a copy of my profile. The profile puts all the tests together to show what areas should be priorities. It also provides benchmarks in each category so that you know what a reasonable next goal looks like. In looking at the workouts BLAST prescribed me to fit my profile, I realized that the profile testing and the classes fit together. The different speeds Lauren C. was calling out? I’d been thinking of them as easy, medium and hard, but they could also coincide with the heart rate zone someone wants to be in during the workout. The thing I liked so much about BLAST was that it actually taught me something, instead of just massaging my ego and telling me that I could do it. For a certain set of D.C. residents, quite a few of them GW students, workout gear branded with one’s favorite studio logo has become like gang apparel. For me? I’ll ride (technically, run) with BLAST’s red symbol.